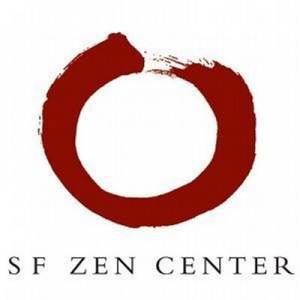 I have a sticker in my office that says “Zen Buddhism: Don’t even think about it!” This kind of humorous take often leads to the (false) perception that Buddhism and its more western-palatable “mindfulness” cousin are about disengagement, a sort of blissful denial of reality in which the practitioner’s magical skill is to sit there in utter peace and emptiness, able to tune out the world even while the world around is unraveling. In an open letter to California Governor Brown published yesterday in anticipation of tomorrow’s massive March for Real Climate Leadership in Oakland, dozens of leaders and members from the San Francisco Zen Center — including the central abbesses and well-known figures such as actor Peter Coyote — dispel the notion of the passive, agreeable monk unfazed by any earthly rumblings below or outside his or her cross-legged self. We write to urge you to ban hydraulic fracturing — fracking — in California and, more generally, move away from making our state a major producer as well as a consumer of fossil fuels. We celebrate that you have, in your inaugural address, made a renewed commitment to addressing climate change. 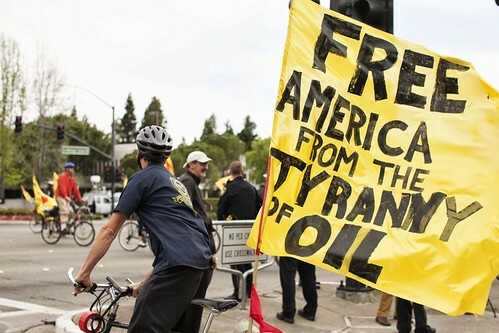 We know — you, and us, and many in California and elsewhere — that hydraulic fracturing is destructive of so many things. It has a long, deep, devastating impact on many species, as well as human beings. It is a theft the present makes from the future, compromising for the sake of the few who profit in the present, long-term well-being for the many to come. It commits us to continue pursuing fossil fuel and with it climate-change emissions when we know, as you said in your inaugural, we need to take “significant amounts of carbon out of our economy.” This should mean not only what we consume here in the state, but what we produce to be consumed anywhere. That carbon goes into the upper atmosphere, wherever it is burned. Too, fracking devastates water, both in the huge amounts used in the process, and in the lasting contamination of groundwater, a terrible waste in a dry state. We can leave that oil in the soil. And we must. We ask that you sign a bill banning fracking and help turn us away from the age of fossil fuels with its immeasurable and lasting damage to the biosphere. California, with its extraordinary implementation of energy-efficiency standards during your first term as governor, with Assemblywoman Fran Pavley’s emissions legislation in 2002 that set nationwide standards under the Obama administration, with the California Global Warming Solutions Act of 2006, has often led the way for the rest of the country. What happens here matters everywhere. It is, of course, the foundation of any meaningful spiritual practice to gain awareness of your own thoughts and their tendency to jump at the slightest movement and distraction, like puppies in a park. Sitting in silence is one way to observe that inner puppy and learn how to direct it in the most beneficial ways, for your own clarity and peace of mind. However, once you’ve reached a place where your mind is calm enough to distinguish between the chatter and what matters, there’s nothing more natural, fulfilling, and, in fact, logical, than to be engaged in the world and actively and wholeheartedly seek to fight injustices and sufferings where they exist. To take Jack Kornfield’s “After the Ecstasy, the Laundry” term, I look at it in a “After the Enlightenment, the Action” context. These California Zen Leaders speaking out against the wholesale destruction of this beautiful planet is putting the idea of using the wisdom and mindfulness gained during meditation towards a greater worldly good — even, or especially, at the risk of coming across adversarial and non monk-like — into practice. In fact, meditation itself can be a form of active protest, as it did this morning, when a group of 15 to 20 Buddhists joined more than 150 protesters blockading the California State Office Building in downtown San Francisco to bring awareness of the dangers of fracking to Governor Brown, who has been known to quote the founder of the San Francisco Zen Center, Suzuki Roshi. 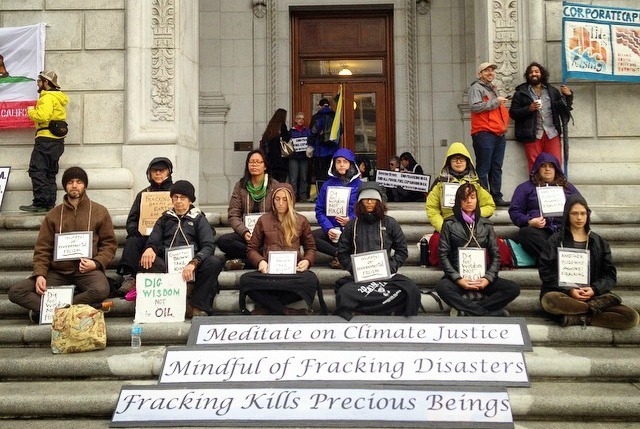 A group of 15 to 20 people from the the Buddhist Peace Fellowship are sitting on the steps of the state building meditating, amid banners that read, “Mindful of Fracking Disasters” — a direct appeal to Brown, who identifies as a Buddhist. Photo courtesy of Brooke Anderson. 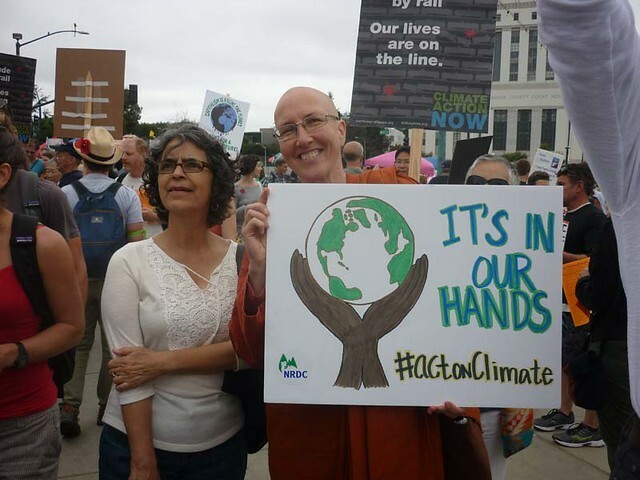 Expect to see a lot more Buddhists (as well as all kinds of other people of faith) making their voices heard at tomorrow’s March for Real Climate Leadership. There’s really not much to think about here. 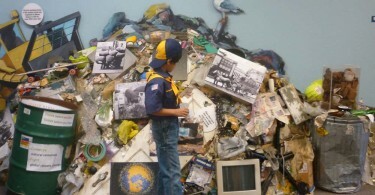 If you’re in the Bay Area, just come out and envision the world we wish to see, together! 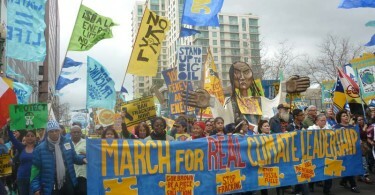 Calling all Bay Area Cyclists: Join the March for Real Climate Leadership BIKE CONTINGENT on February 7th in Oakland! On Saturday, February 7th, thousands of people from across California will take to the streets of Oakland to call on Governor Jerry Brown to end fracking, stand up to Big Oil, and move beyond fossil fuels to 100% renewable energy. While Gov. Brown has announced some ambitious renewable energy and climate change goals for the state, he still continues to allow the oil industry to expand fracking and extreme energy extraction. This is a chance to show how cycling is a major part of building a world we want to see, without fossil fuels. We’re hoping that you can come out and join the BIKE CONTINGENT which will be equipped with beautiful flags made by our arts team. RSVP HERE or just show up to receive your bike flag! WHERE: Meet under the big Oak tree on 14th and will stay along 14th St closest to the street. BONUS – There’s going to be a rally at the Lake Merritt amphitheater after the march where Oakland-based Rock the Bike is showing up with its pedal-powered sound system to make sure speakers, Djs, and bands are well-amplified without any dirty energy. This will be their biggest pedal-powered event to date! 16 bikes will require pedalers for about two hours. This can be a really strong crew of 16 riders or a relay — however it works out. If you’d like to help power the stage, just show up!